First invented in Aquaria, the technique of crafting has grown to both a science and an art form. Laurel constantly researches new ideas and innovations in the Cauldron. Spell Teas with all kinds of incredible magic abilities, from bramble breaking to speeding up time, are always being discovered and will prove key to victory. Whether busting Shadow Punks or riding your broom, potions help restore mages and elves to their fullest strength. Whether it’s a drained wand or low health, there’s a potion for every problem. Terra has found and created new combinations to bring out strength and magic of all mages, elves and Mythies but there’s always more to discover. 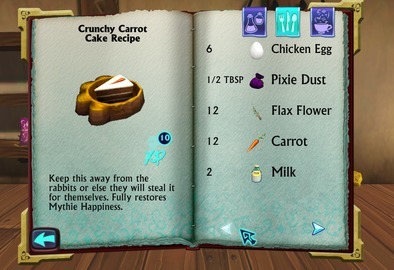 Foods are crafted for the Mythies. Mythies love nothing more than adventuring, bonding and playing with their mages. But because they’re so active, they get hungry. 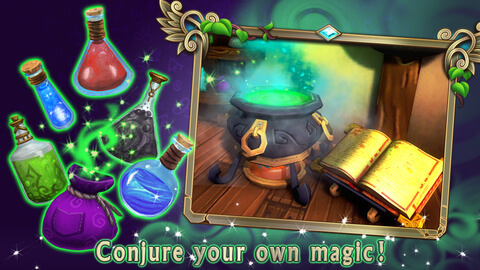 Mix up interesting and new combinations at the Cauldron and watch your Mythie’s energy go up.